How Can You Improve Your Brown Bag Lunches? One of the realities of modern life is that our environment is different today. We eat more meals away from home and, when we do, the options available are less nutritious than ever. Maintaining good health may require more focus today than it was a hundred years ago, but it’s just as important as it always has been. If your schedule requires you to consistently eat meals away from home, packing your lunch can go a long way towards your health and your budget. 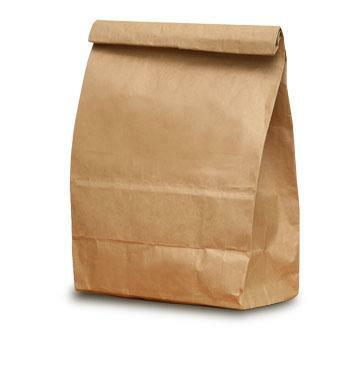 Remember, brown bag lunches are not just convenient for work and school. Having healthy snacks on hand is important while traveling, hiking, spending a day at the beach, or any other time you’re away from home for an extended period of time. Finally, if you’re not already spending the day outdoors, be sure to take the opportunity to enjoy the outdoors while you’re eating your brown bag lunch. Find a patch of grass or a park bench and take a few minutes to reconnect with nature while you eat. Breakfast typically gets all the credit, but a healthy, relaxed lunch can do wonders for physical and mental health. Want to help the environment while you’re at it? Forego the brown bags and use a re-usable lunch bag. Whether you’re packing your own lunch or packing lunch for a spouse or child, you will find a few ideas below for fresh and nutritious meals on the go that don’t involve processed deli meat. 1. PB & J: There’s a reason the peanut butter and jelly sandwich has been around for generations. 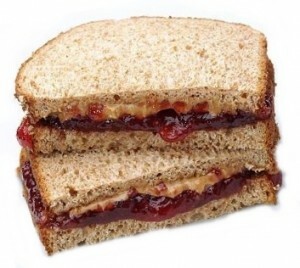 A peanut butter and jelly sandwich prepared on whole grain bread is easy to make and requires no refrigerator. If you’re ever bored with peanut butter and jelly, try changing things up with a PB-and-banana sandwich. Spread both slices of bread with peanut butter and then layer pieces of a banana on top of one piece of bread. Place the other piece of bread on top and you’ve got a PB-and-banana sandwich. 2. TUNA SALAD SANDWICH: If you want a meatier sandwich, replace your cold cuts, which are packed with nitrates, with canned tuna and organic mayonnaise. Be sure to look for a BPO-free can and don’t forget to add a few leaves of Romaine lettuce, or even sliced avocado. 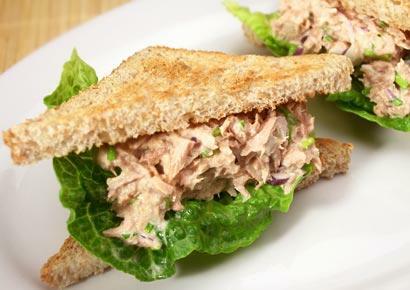 While tuna is arguably healthier than cold cuts, be sure to limit your tuna salad sandwiches to once or twice per week due to mercury content. If you’re looking for a way to spice up your tuna, try mixing in chopped celery, chopped apples, or even chopped raisins. 3. LEFTOVERS: You’ll need to invest in some glass to-go containers for this, but it’s worth it. Never let your dinner leftovers go to waste again. Instead of storing leftovers in one large container, use several smaller lunch-sized containers. 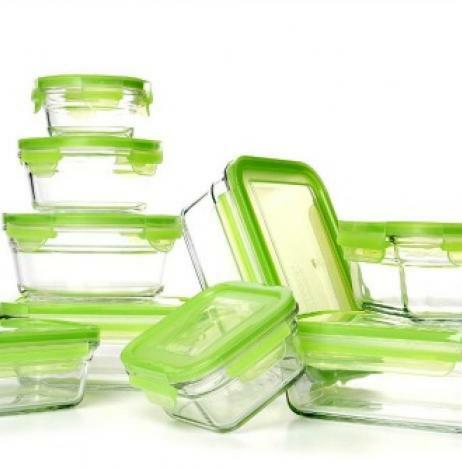 Washable, glass to-go containers will last for years and are much more cost-effective for the long haul than disposable containers. On your way out the door, grab a container from the fridge and toss into your bag. You may be surprised to find that many leftovers taste delicious without re-heating. 4. GREEN SALAD: If you’re eating at your desk, a salad may be easier to make than it sounds. If you’re able to leave a bottle of olive oil and a bottle of balsamic vinegar on your desk at work, you can have a healthy salad every day. The key is to avoid soft, wet ingredients. 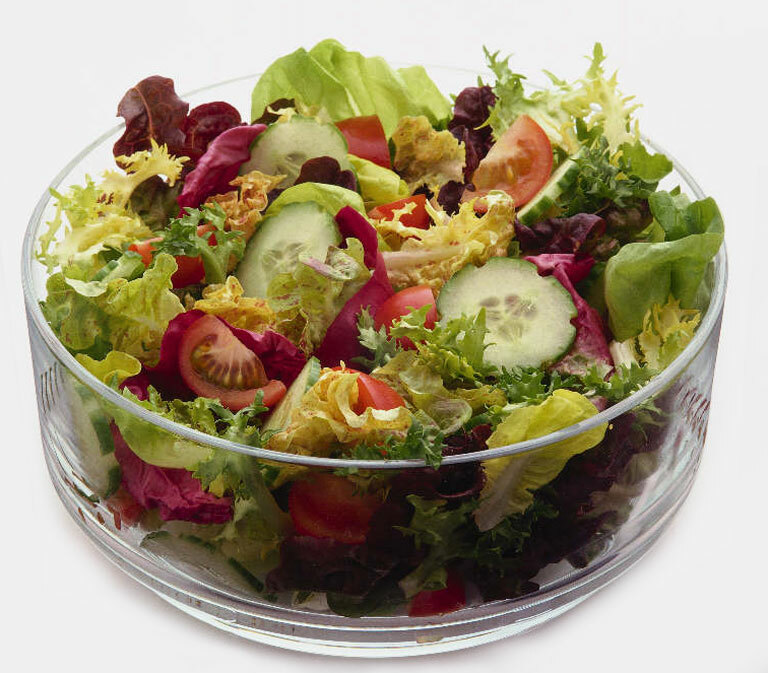 The night before, prepare your salad as you usually would except without the dressing. Start with lettuce or spinach leaves, and then add protein (grilled chicken, beans, hard-boiled egg, chopped nuts), produce (sliced cucumbers and shredded carrots work well), and cheese. Top with equal parts olive oil and balsamic vinegar when you’re ready to eat. 5. CAPRESE SALAD: Bored of green leafy salads? Try a caprese salad instead. 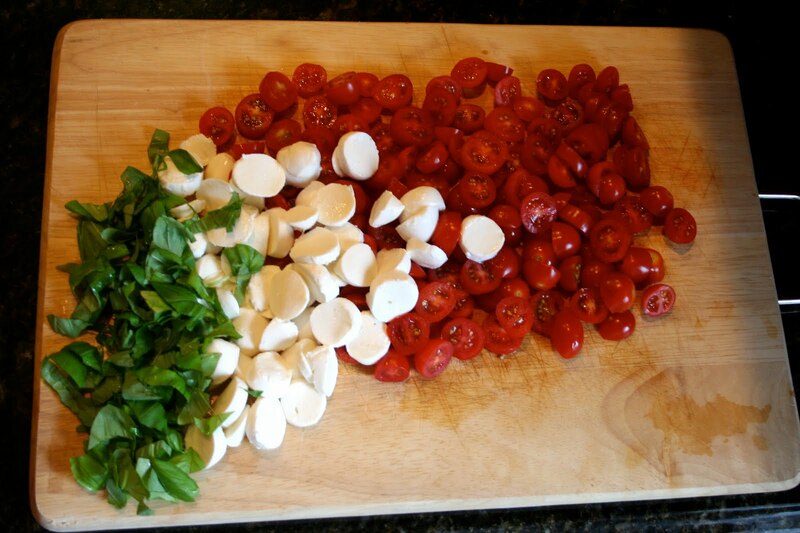 In a glass to-go container, layer slices of tomato, fresh mozzarella, and fresh basil leaves. (Feeling ambitious? Try growing your own basil plants.) For a change, add pieces of avocado. Sprinkle with salt and pepper and store in the fridge. Just before you’re ready to eat, drizzle with olive oil and balsamic vinegar. 1. FRUIT: Never pack a lunch without fruit. 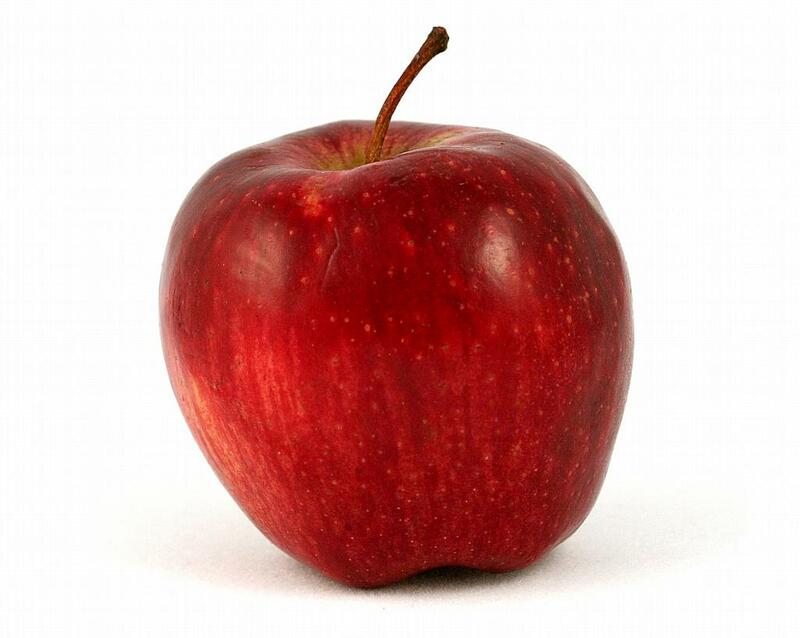 Depending on the season, you have a variety of options: a banana (slightly green/firm is best to withstand the pressure of packed lunches), a washed organic apple, an easy-to-peel tangelo, a bunch of organic grapes, washed organic berries, or sliced seasonal fruit in a glass to-go container. For a heartier mid-morning snack on the go, pair with a carton of yogurt topped with nuts. 2. NUTS OR TRAIL MIX: From almonds to cashews, nuts provide a convenient mid-day boost of nutrition and energy like no other snack. Keep a bag of raw nuts in your desk drawer. Or add raisins and organic (or homemade) granola to create your own trail mix. 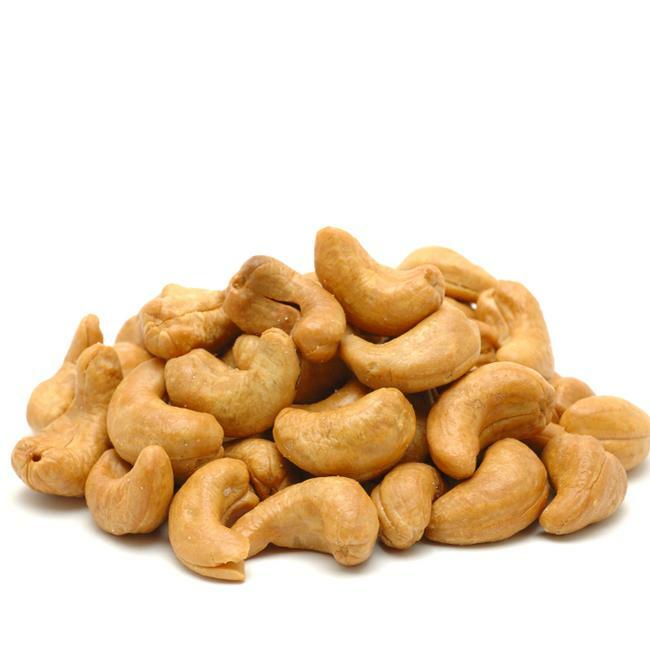 Check the package and avoid nuts that have been roasted in oils; instead, opt for raw nuts. Almonds, walnuts, cashews, and pistachios tend to pack the most nutrients. As with any food, the key is variety. 3. STRING CHEESE: While it may not be as fresh as the rest of these suggestions, the convenience of organic string cheese can’t be beat. In case you’re curious what makes string cheese stringy, you can watch a news segment on the process here. In short, when you heat mozzarella cheese above 140 degrees and then cool it down, it becomes stringy. 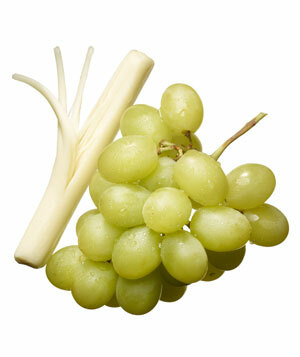 Paired with fruit, string cheese makes a perfect mid-morning or mid-afternoon snack. Even better, string cheese is always a child-pleaser! 4. VEGGIES AND DIP: Spoon a dollop of homemade vegetable dip into a glass jar and top with standing veggies. Carrots and celery sliced lengthwise work well. 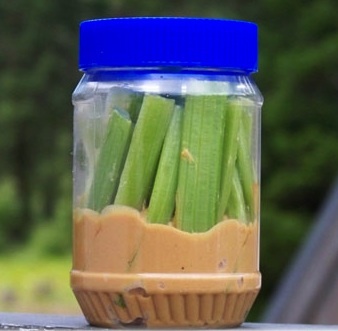 Organic peanut butter and celery is another combination to try. You may have to experiment a bit with jars and glass containers to find the right size container for this, but it’s worth it. This treat is also a great kid-friendly snack for road trips, too. 5. HOMEMADE BREAD: A loaf of banana bread baked over the weekend can turn into a treat for lunches all week. By baking something — as opposed to buying it — you have already won half the battle. Be sure to check out our tips for healthier baking here. If you’ve never experimented with whole wheat flour before, banana bread is the perfect opportunity. Have I forgotten any healthy lunch options? Please let me know by leaving a comment below! Author WEPosted on May 1, 2013 July 14, 2014 Categories Changing Your Behavior, DietTags healthy brown bag lunches, healthy lunches on the go, healthy packed lunches, healthy school lunches, nutritious brown bag lunches, nutritious lunch on the go, nutritious packed lunches, nutritious school lunch ideas, sandwich alternatives, what makes string cheese stringyLeave a comment on How Can You Improve Your Brown Bag Lunches?